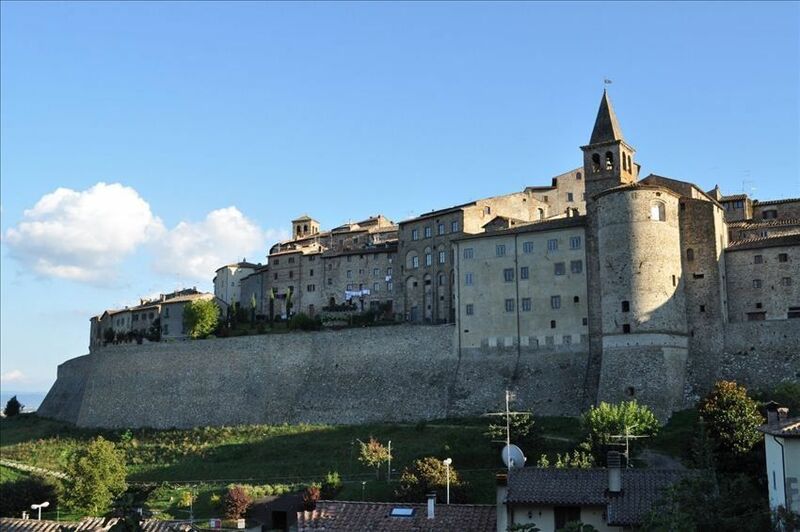 Perhaps the finest townhome/apartment in Anghiari. First time renting in 2011. Our townhome is three stories, built into the gate/wall of the old town in 1204. Designer/decorated, the best of medieval architecture blended with traditional antiques and Italian modern with new kitchen and bathrooms. About 175 sq metres (1800 sq feet), there is a sense of spaciousness and elegance. A separate dining room with arched brick ceiling has direct access to dining terrace with gorgeous views of the Tiber Valley. The living room is furnished with Busatti fabric, Persian carpets and antique fireplace. The large master bedroom (king bed) and bathroom are on this floor. The Varenna kitchen is all stainless steel. Upstairs, there is a very large audio visual room with two modern Italian leather couches (good for grandchildren to sleep on) and second master bedroom (king bed) with cathedral ceiling and bathroom. Access to the upstairs terrace for taking in the sun or cocktail parties. You will love it Our property manager is available onsite.